With all the pandemonium online, you’ve surely heard about Gillette’s new creative, “The Best Men Can Be.” In a 1:50, the brand tackled a number of societal issues, including the #MeToo movement and bullying, and delivered a hopeful message that the power (& responsibility) to change lies within each and every one of us — with a focus on men. 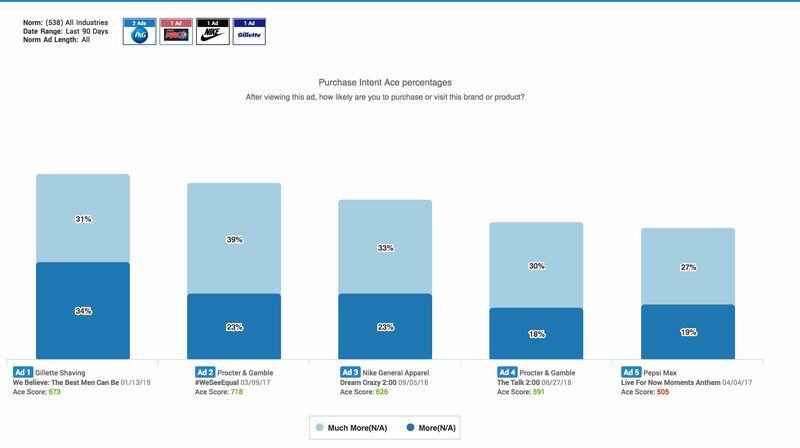 We have done a great deal of research on brands taking stands (with findings that identify keys to success and where things can go wrong) and analyzing such blockbusters as Always’ “Like a Girl,” Pepsi’s Kendall Jenner “Live For Now,” Nike’s Colin Kaepernick “Dream Crazy,” Airbnb’s “#WeAccept,” P&G’s “We See Equal” and “The Talk,” among others. Each of these brands went bolder than nuanced visuals and messaging, obviously accepting the inherent risk. Relative to overall advertising norms over the past year, as well as several other “controversial” social statement ads, the long form “The Best Men Can Be” spot easily beat norms across all performance measures we track, delivering something new and very relevant to viewers, in an Attention-grabbing and Likeable manner. Common to previous social stance ads, naysayers were quite loud on social media. 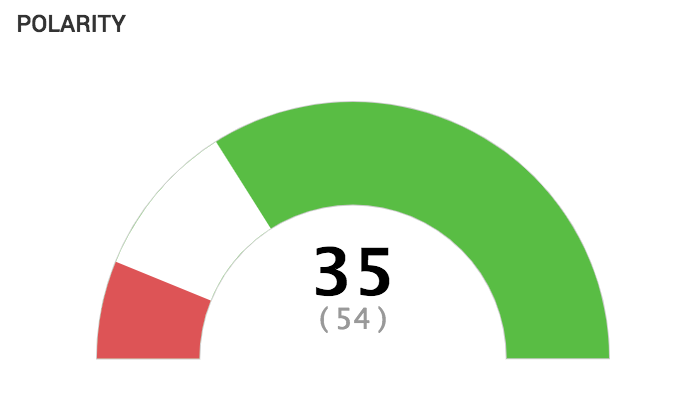 However, across the full audience, the ad was far less polarizing than social media would suggest, falling in one of the lowest (bottom 2%) polarity percentiles, with most responses overall positive (as represented by the relative size of the red vs. green bars in the polarity graph below). For comparison, Nike’s “Dream Crazy 2:00” polarity score fell within the bottom 10% of all ads, making Gillette’s new spot the less polarizing of the two. Viewers of all ages, genders, ethnicities, incomes, and locales overwhelmingly loved and supported the message behind “The Best Men Can Be,” with very strong emotions evoked. 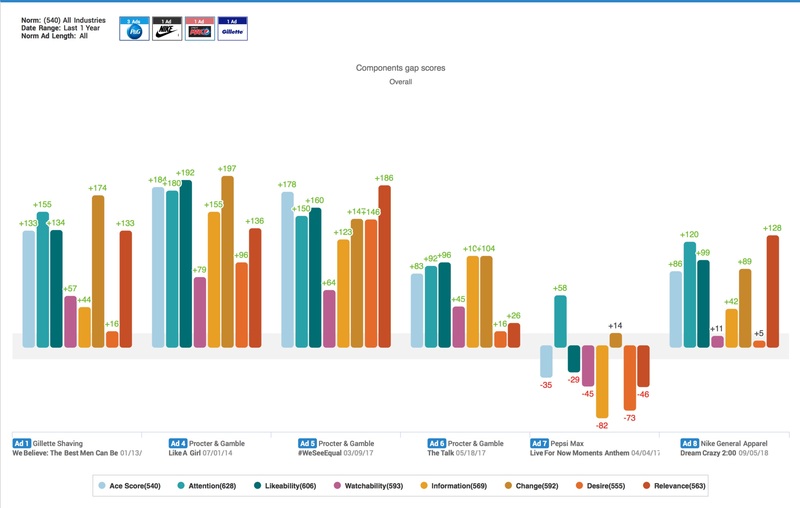 The “Powerful” and “Corporate Responsibility” responses recorded ranked among the very top percentile of all ads tested across all categories since January 1, 2014, confirming that consumers are strongly in support of the message. 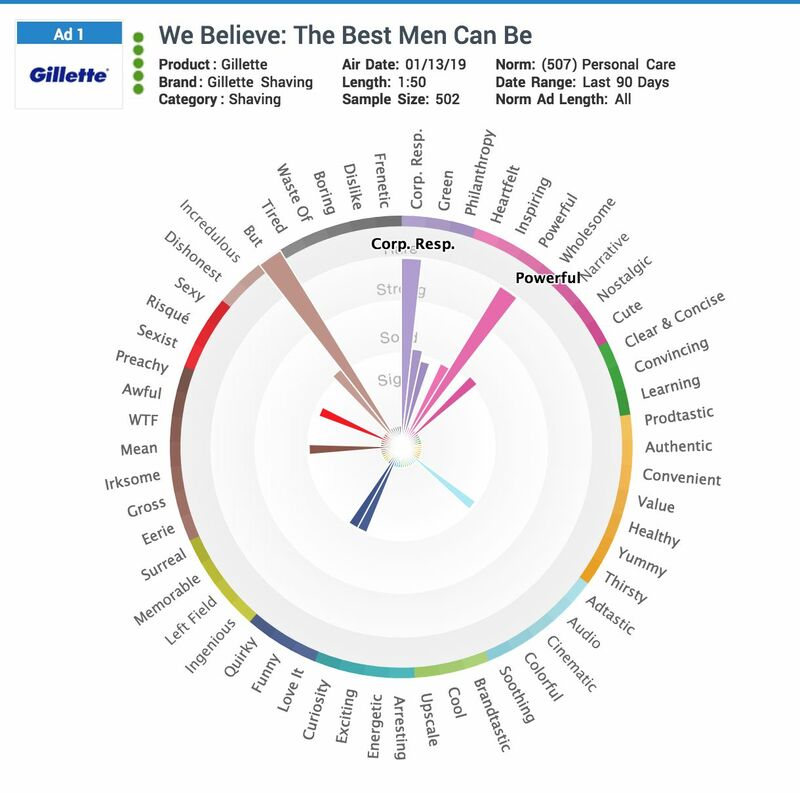 This creative actually developed the strongest positive purchase intent among several recent “social stand” ads, with 65% of viewers indicating the ad made them more/much more likely to purchase Gillette, and two-thirds rating the message the single best thing about the ad. These results suggest that (once again) the naysayers on social media do not necessarily represent the majority opinion, and that consumers overwhelmingly support and applaud the messaging in the new “The Best Men Can Be” work. While viewers of these ads were not privy to the donations Gillette is making behind the associated causes, the risk of taking the stand here clearly was worth taking.